Cottonwood trees are common site along the riparian waterways along Boulders many open space properties. These large tree's each have their own unique personality and look. The softer wood of the Cottonwood tree means that heavy snow or wind may break limbs and contort the tree into its own unique outline over time. 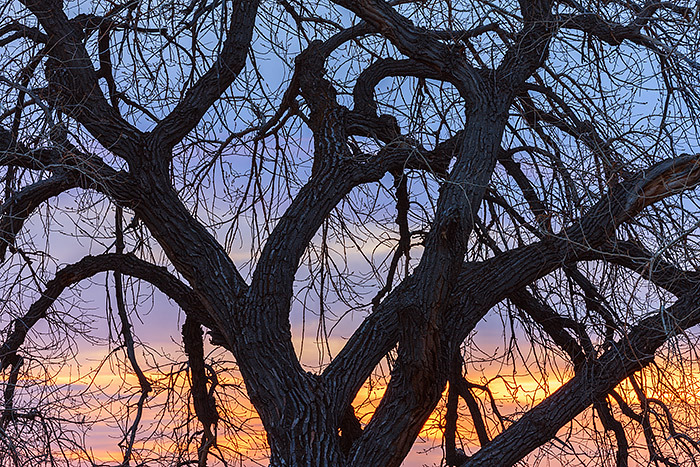 Here one of these older Cottonwood trees is silhouetted against the colorful morning sky near the Eagle Trail and Boulder Reservoir. . Photo © copyright by Thomas Mangan.